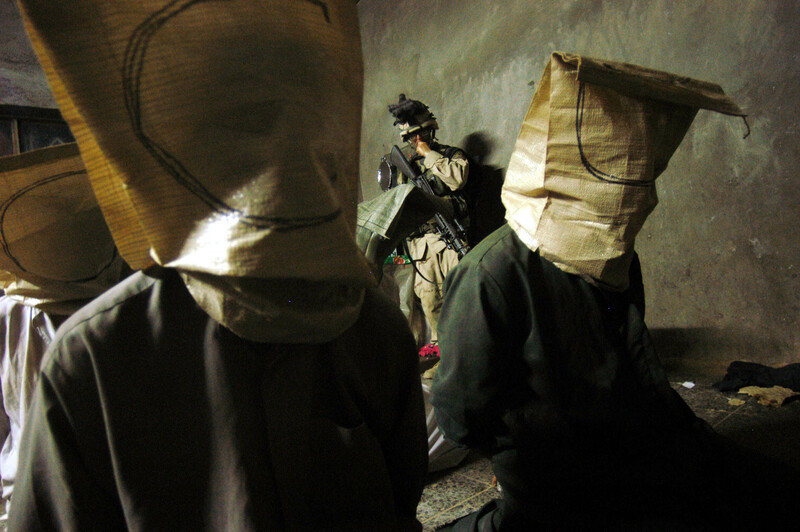 A Soldier with the 4th ID, 3rd Brigade, from the 1st Batallian-68th Armored Regiment stands guard over detained Iraqis found on a compound American intelligence indicated belonged to members of the Bathist party and supporters of former Iraqi leader Saddam Hussain in the early hours of the morning roughly 30 km North of Baghdad near Balad, June 29, 2003. US troops acted as part of a massive, across the 4th infantry division series of night raids and patrols that took place in the early morning hours of the 29th as a way of showing their force and retalliating against the recent spate of attacks against US troops throughout Iraq. The area of the raids encompassed the area north of Baghdad as far as a bit past Tikrit, along the Tigris, where there are presumed to be Bathist strongholds, and deep-roted support for former Iraqi leader Saddam Hussain.